The double-decker A380 jumbo jet was French aircraft manufacturer Airbus’s answer to the Boeing 747. Plans for the 600+-seat jumbo jet began in 1991 when Airbus started discussing its plans with the world’s airlines. There are 13 airlines flying 195 A380s around the world. They include Singapore Airlines, Emirates, Qantas, Air France, Lufthansa, Korean Air., China Southern Airlines, Malaysia Airlines, Thai Airways International, British Airways, Asiana Airlines, Qatar Airways, Etihad Airways. The Toulouse, France-based manufacturer wanted an entirely new large aircraft that could handle high-density, long-haul routes like Hong Kong-London where passenger traffic was growing and capacity was under pressure. Airbus moved ahead with what they called the A3XX, consultation with airlines, airports, aviation safety authorities and pilots. On May 1, 1996, Airbus announced it had set up a “large aircraft division” to develop the A3XX, created to refine market studies already undertaken, define the aircraft specifications process input from the airlines. By 1998, Airbus was in consultation with some 20 leading airlines about what they wanted to see in the proposed double-decker A3XX. The program was officially launched in December 2000, when it was renamed the A380, and four years later, the final assembly line in Toulouse was officially opened by France’s prime minister. The aircraft would be capable of carrying 525 people in two classes non-stop from Europe to Asia, North America, and South America. 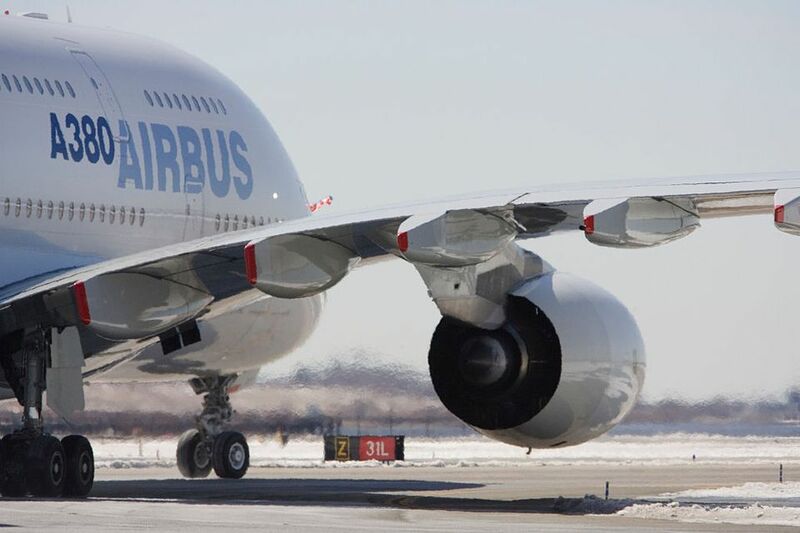 The first A380 was unveiled on January 18, 2005, with 14 launch customers and 149 orders. The jumbo jet’s first flight took place in Toulouse on April 27, 2005, and lasted for three hours and 54 minutes. After some production delays, the first A380 was delivered on October 15, 2007, to Singapore Airlines. The carrier’s A380 featured 471 seats in three classes – including the innovative individual suites for first-class passengers -- on its Singapore-Sydney route. Following three more deliveries to Singapore Airlines, Airbus delivered the first A380 to the Dubai-based Emirates on July 28, 2008. Australian flag carrier Qantas was next to receive the A380, on September 19, 2008. The 50th A380 was delivered on June 16, 2011, to Singapore Airlines, joining operators Air France, Emirates, Korean Air, Lufthansa and Qantas Airways. The A380 is the world’s largest commercial aircraft flying today, with a capacity of 544 passengers in a four-class configuration, and up to 853 in a single-class configuration. It features a main deck and an upper deck, linked by fixed stairs forward and aft. Airlines have the flexibility to create different cabin segments on the jumbo jet to get the maximum profit. Among the configurations available are the standard four-class cabin -- first, business, premium economy and economy. Airlines also have the choice of offering an 11-abreast economy section with 18-inch-wide seats. The A380's cabin flexibility allows airlines to differentiate their products and develop layouts tailored to their market requirements. Singapore Airlines’ first class Suites feature an individual cabin with sliding doors and window blinds, an armchair hand-stitched by master Italian craftsmen, a standalone bed, a 23-inch wide LCD screen and extensive audio and video-on-demand. Emirates’ A380 suites feature privacy doors, a personal mini-bar, a private in-flight cinema, a seat that converts into a fully flat bed with mattress, a vanity table and mirror and access to an onboard shower. the Dubai-based carrier is the largest operator of the jumbo jet, with 83 in service and another 142 on order. On November 1, 2016, the carrier began operating the jumbo jet between Doha, Qatar, and Dubai, a flight that takes less than an hour to fly. And then there is The Residence, an apartment with a living room, bedroom and private bathroom, featured on Abu Dhabi-based Etihad’s A380. The living room has a leather double-seat sofa with ottoman, two dining tables, a chilled drinks cabinet and 32-inch flat screen TV. It also comes with a butler and a private chef. All passengers’ comfort is further enhanced by technologies equipped on A380, including advanced lighting systems, new standards of in-flight entertainment, cabin air that is recycled every two minutes and natural light provided by 220 cabin windows. The A380 fleet operates on about 100 routes to 50 destinations around the world, with a jumbo jet taking off or landing every three minutes. As of September 2016, Airbus reported that the A380 had 319 orders with 19 customers, 190 deliveries and a backlog of 124. But the jet hasn't had one order from a U.S. carrier and only a handful of orders from major operators including British Airways, All Nippon Airways, Air France, Asiana Airlines, Qatar Airways and Virgin Atlantic. In July, 2016 Airbus announced that it was cutting production of the A380 in half, going to just one jet a month by 2018. The manufacturer called the move a way to smooth its production schedule. But industry observers feel this production cut is the beginning of the end of the aircraft type, with many noting they don't expect the full backlog of jets to ever be delivered. History information courtesy of Airbus. A History of Airbus for Non-Aviation Geeks. Here's the Boeing 707, the aircraft that helped kick off the jet age. These airline cabins offer the ultimate passenger experience. I go to Pinterest to highlight airline paint jobs from the past. Go back and watch these classic airline television commercials.